Mini-PCs, especially the fanless variety, have garnered ever more attention over the years and for some time Streacom have been at the forefront of chassis designs and components for self-assembly systems. Their case range includes a host of fanless all-aluminium mATX, ITX and smaller designs, but they also understand the need for complementary small form factor power supplies (adhering to the nano/pico-PSU standards) and accessories such as IR sensor kits and VESA mounts. 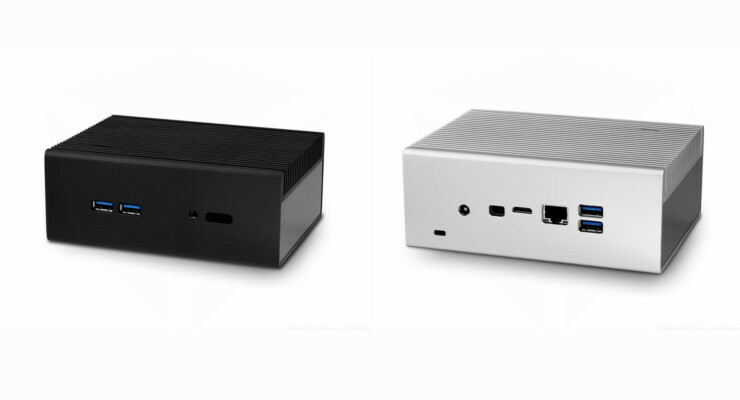 Today Streacom are unveiling the NC2, a new compact chassis for the Intel® NUC Platform. Designed along similar lines to the more slimline NC1, the 11mm taller NC2 allows for internal storage beyond the motherboard-mounted mSSD in the form of a 2.5" HDD/SSD. As the capabilities of tiny form factor systems continue to increase fast and capacious storage will be an integral part of a good all-around experience, and the NC2 shows how important Streacom view it to be to users. Complementing possible SATA drives is the inclusion of a short SATA Data+Power cable. Due to the slight variants in Intel NUC models there are four NC2 sub-types. Differences in front panels, back panels, and CPU mounting brackets mean that ordering the correct version (found on the NC2 product page) for your model is essential. The NC2 inherits other features of the NC1 including acrylic sides for internal WiFi/Bluetooth, efficient passive cooling and modular assembly. It's also compatible with VM1 VESA mounts and the InFi2 Antenna kit, which are sold separately. For more information on the NC2 and other fanless chassis or SFF components visit Streacom.com.